This was an old stand-by in our family home on icy Pittsburgh winter nights when cold weather kept us indoors. This fruit based dessert has the same flavors as apple pie without the guilt of a fattening crust, clocking in at around 200 calories a piece! If you love this recipe and you’re looking for more tips on how to live a delicious holistic life, join my facbooke group Body and Soul Alchemy. Like the crockpot baked apples recipe on this page? 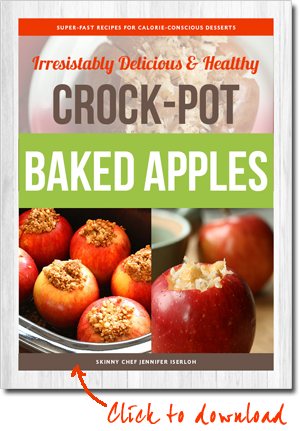 Get a whole booklet with additional baked apple recipes. In a large bowl, mix brown sugar or stevia, walnuts, butter, and cinnamon. If you don’t want to use walnuts, you could use pecans or go nut-free by substituting with 1⁄4 cup chopped raisins, prunes, or granola! Another great substitution is 1⁄4 cup of rolled quick oats moistened with a tablespoon of water before stuffing the apples. Use a grapefruit spoon that has the sharp edges (or a small pairing knife) and core most of the way through, I leave about 1⁄2 inch apple left at the bottom. You could remove the skin but I find that it helps to hold the apple together as it bakes – it also adds extra fiber which is always a plus. Fill the apples with the filling and place them in the crock-pot.Pour the water or cider (and the liquor, if using) into the crock-pot, around the apples. 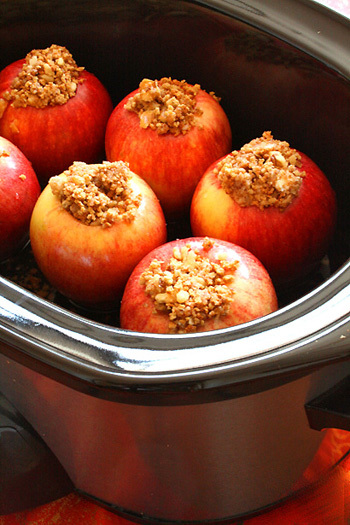 Set the crock-pot on high heat and cook 21⁄2 to 3 hours until the apples are soft and begin to collapse. If you don’t have a crockpot or slow cooker, you can use a 7×11 casserole dish or stock pot. Preheat the oven to 350F and cover the pan with aluminum foil. They’ll take about 45 minutes to one hour, adding additional water (about 2 tablespoons) half way through baking. A glass baking dish is also an option, just be sure to lower the heat slightly 5-10 degrees since glass can cause food to burn. If you’re making this recipe for a large crowd, you could do these in the oven in a large disposable roasting pan and just double the recipe. They also taste delish with a scoop of frozen vanilla yogurt or coconut ice cream.You can refrigerate these for up to 3 days, but store them in an air-tight container so they don’t pick up odors from the fridge. Nutritional Stats Per Serving (1 apple): 214 calories, 1 g protein, 34 g carbohydrates, 7 g fat (1 g saturated), 0 mg cholesterol, 2 g fiber, 50 mg sodium. Sure, no need to use a crock pot. Just place them in a stock pot. Preheat the oven to 350F and bake for about 45 minutes. Or wrap them in foil and put them on the edge of you camp fire. You can, but I’m not sure what the timing would be, I imagine you would cut the time in half! And THANK YOU for putting the recipe near the top and not making us scroll through 13 photos of the finished product! Great recipe. Looks like you leave the skin on, any reason why you couldn’t take it off? Do I have to preheat? I want to make them tonight! I found the recipe to not call for enough stuffing. The apples I used were even on the smaller size and I doubled the stuffing recipe. Next time I am going to make way more stuffing and add more walnuts. But, there will be a next time! found this recipe on twitter and i plan to make these this weekend! any suggestions on modified instructions for a large crowd? do you think one of those large, disposable roasting pans in the oven would work? Thanks for writing in. Sure you could do these in the oven in a large disposable roasting pan and just double the recipe. Preheat the oven to 350F and cover them. They’ll take about 45 minutes to one hour in the oven. They also taste delish with a scoop of low-fat frozen vanilla yogurt. This may be really obvious, but what do you mean “stuff the apples”? How do I get the apple flesh out? Thanks for writing in. If you look in the ingredient list it calls for the apples to be “cored”- that means to remove the core so there is room for the filing. How do you reheat the apples after they have been in the fridge? Warm covered in the microwave for 1 minute or 20 minutes in a 200F oven. The Pampered Chef sells a corer. Look it up on their website. I love mine. The kids find it fun tri have an apple with a hole in it. Either term works here, I guess I used stuff since I tend to press the filling down into the apple…. ooohhhh…ha ha, I totally missed that! Thanks so much! This looks delicious! Quick question… when you said, “Pour in the apple juice or cider and the liquor” do you mean pour INTO the apple or crock pot? Thanks! 🙂 I look forward to making these baked apples. You can pour both around the apples, inside the crock pot. Have a great Fall! These look SO yummy, I am really excited to make these, but I was wondering, are the apples cored all the way through to the bottom or are they more like little cups, holding the “stuffing” in? Nope- the filling stays in because they stand up right in the pot and the filling is really stiff – even if you happen to core all the way through. I usually use a pairing knife and leave, 1/2 inch at the bottom of the apple in tact. Okay great! That is kinda what I figured, but I just wanted to be sure. Thank you so much for your quick response! Can i use softened real butter instead of margarine or is it best to use the margarine? You can use butter – but the reason I call for trans-fat margarine has to do with the high saturated fat content of butter which means trouble for your cholesterol. Butter in moderation is ok if you have a clean bill of health from your doctor. My boyfriend is not a fan of walnuts or an nut for that matter. Do you have any suggestions on what to substitute walnuts for? You could use pecans here or to go nut free substitute 1/4 cup chopped raisins or prunes! Hey, could I use the brown sugar Splenda instead of regular brown sugar? Sure you could, it would work fine. Over all I’m not a fan of artificial sweeteners but in some cases it’s the only option for people blood sugar issues. Great, easy recipe. Tasted really good and not heavy which was nice since I’m dieting. These were a real treat. I use my crock pot all the time because I also work, so I am constantly trying to find recipes. I was thrilled to find this one since everyone in my family loves apples. Okay – I made this last month and everyone went crazy over it! It made the house smell so warm and cozy (added benefit!!). I have made this three times since and keep getting more requests for it! I guess this one is a keeper!! oh.my. goodness. …cant wait to do this ..heading to the farmers market for apples now! With farmers market apples — it will be a masterpiece! I don’t have apple juice or cider…anything else I can use? I just found a carton of apple lime juice…would that be too sour? Can I use apple cider vinegar? Apple lime juice should work! You can use apple cider vinegar but mix it with water and a teaspoon of sugar. I can’t wait to try your recipe! But I have a question. Just out of curiosity, why do you have to pre-heat the crock pot for 3 hours prior to even cooking the apples? Couldn’t you just put them in when you start the crockpot and extend cooking time to 5 instead of 2.5 hours? Do you pour the apple juice/cider into each individual apple? Or just in the bottom of the crockpot/pan? This recipe looks AWESOME and I’m so excited to make it tonight for a Halloween party!!! Could I use granola instead of walnuts? My family is not a huge fan of them, and I have some granola left over from another recipe. Just curious. Thanks! The juice goes around the apples. Enjoy! I love this recipe idea! I am living in south korea and it is very uncommon for any of the foreign community here to have an oven or a crockpot. I do, of course, have a rice cooker. Would it be completely impossible to make something like this? A group of my friends have decided to try doing a potluck thanksgiving here, but finding no bake holiday recipes is sooo difficult. I love my rice cooker and use it often! I’ve never made these in a rice cooker, but I’ll test them out and report back. What a great idea. Does the type of apple you use make a difference? Really, you can use any kind of apple, I like to use MacIntosh because they puff as they bake, and golden delicious will be a bit sweeter. This looks yummy! Any idea on how many calories per apple? Hi! If I bake In the oven, what kind of pan can I use instead of the crockpot? A 7X11 casserole dish would work great. A glass baking dish is also an option, just be sure to lower the heat slightly 5-10 degrees since glass can cause food to burn. Could you use granny smith apples for this?? Delicious! My hubby was excited when he saw me preparing them, but when they were done he said ,”That looks gross.” But then he licked the bowl! We added 2 scoops of vanilla ice cream. Loved it! So glad I made extras (4 total) so we can have them tomorrow night!! Ha so funny! True they do shrivel when baking, but sometimes ugly can still be delicious– sort of like meatloaf! How do you eat/serve this? For/Knife?? Are the apples still hard? They are very soft – I usually just cut into them with the slide of a spoon but you could have butter knives handy. Are the apples able to to be refrigerated for a couple days after they are made in the the crockpot? Sure, you can refrigerate! But store them in an air-tight container so they don’t pick up odors from the fridge. Delish! I will have to make these for my next dinner party. They will be perfect after a big meal. I would be tempted to add oatmeal, since I am almost always out of nuts when I need them….thanks for sharing! Sure you can add oatmeal in place of the nuts! I am planning on making these this weekend and wanted to know… if I did use Oats, is it the same 1/4 cup? and is it Old Fashion or Rolled Quick Oats? I would use the same 1/4 of quick oats and just add a tablespoon of water to moisten them before stuffing the apples. Let me know how it turns out! So, I am using my crock pot now, for another meal, which takes 10 hours…. If I did cook these in the oven I saw to cook them @ 350 for 45 mins… How deep of a dish? Like a glass Pyrex? ANDD… Does it make a difference in taste/quality to cook them in a Crock? If so, I will wait till tomorrow.. I can’t WAIT to try these.. I would use a Pyrex with glass sides, usually they are 2-inches deep. Let me know how they turn out! could i cook these on low for a longer period of time? Sure- I’m not sure how long since I’ve never done it, but I would imagine maybe 1 addition hour? My oh my this is so easy! I did this early this morning with my 6 and 3 year old girls as a treat for after dinner tonight. They love cooking with me. The pictures and memories fill our kitchen and dining room walls! The house smells so good! I can not wait to eat them! I am using grape nuts as a filler since I don’t like nuts and oats…I think it will be good…I’ll let ya know. Made these tonight! Loved it! Just want to clarify, you let the crock pot heat on high for 3 hours and then cook the apples for an additional 2 1/2 to 3 hours? Hey Stephanie, you cook the apples 2 1/2 to 3 hours after you preset, no additional time needed. How about using Earth Balance Original Buttery Spread in place of the margarine? What’s the easiest way to core the apple? I use a grapefruit spoon that has the sharp edges or a pairing knife. Sure that would work well, you can also use butter if you have a clean bill of health. Do you think that putting these in foil and making them in a smoker would work as well? We are looking for recipes to do a “Smokehouse Christmas” theme this year and we want to make everything in the smoker, from the meats and sides to desserts. I was thinking they would take about as long as in the oven, it will probably be set around 275 for temp, maybe 1-1 1/2 hours? Ohhhh a smokehouse Christmas sounds amazing! I haven’t done much with a smoker. But I would imagine it would be similar timing as the oven instructions. Let me know how they turn out! Any suggestions on what would be the easiest method to make large quantities of these for a party? You can do them in the oven on sheet trays with sides. Cover with aluminum foil and bake at 350F for about 45 minutes or until soft. Just made these today and found high heat cooked too fast in my crockpot. Next time I will cook on med. Also after coring and ready to put filing in, I was afraid the apple would lose the filling so I wrapped a small piece of foil around the bottom of the apple to hold the juices in. Yummy. Can you use red delicious apples or do you have to use gala/macintosh? What is the real difference when cooking? I don’t like the taste of red delicious apples, they are usually bred to look beautiful but don’t have a very good flavor. Golden delicious on the other hand taste great and would work well in this recipe. These look great. I have a question… your instructions say preheat then preset then cook, so I am confused by that. I’ve never seen a pre-heat on a crockpot recipe. I put food in and press the button with low 8 or 10, and high 4 or 6. I just mean to turn on the slow cooker, that way you’re not starting with a totally cold pot. What is the nutrishional info on this recipe? 214 calories, 1 g protein, 34g carbohydrates, 7 g fat (1 g saturated), 0 mg cholesterol, 2g fiber, 50 mg sodium. these are in our slower cooker now, thanks to my 13yr old daughter! she cant eat nuts so replaced them with raisins and chocolate chips! man alive our house is starting to smell good 🙂 cant wait to try them! I made this last weekend and they came out great. I do not own a crockpot so i put them in the oven on 375-400° for 45 mins to and hour and they came out wonderful. Where do u put the apple juice or cider? In the apple or in the crockpot so the apple cooks in it? I’m a little confused, maybe didn’t read the recipe right. Do you pour the Applejuice/cider AROUND the apples in the crockpot, or INSIDE the apples with the cinnamon mixture? Do you suppose you could use coconut oil in these instead of the margarine (never touch the stuff!) or butter? Hey Kathy, if you have a clean bill of health butter or coconut oil is fine. Real butter is so much healthier and better for you than ANY margarine!! Margarine increase risk of heart attack 53%!. Butter helps you absorb nutrients from other foods. Stay away from any margarines! Thanks for writing in D! That’s no exactly true. Margarine that is made without any hydrogenated oils is a good option for people with cholesterol issues, and there are several brands out there that fit the ticket. Saturated fat raises LDL and if you are a candidate for heart disease, eating lots of butter can mean bad news. However if you have a clean bill of healthy butter in moderation is fine. I made this the other day but with a few changes. I used oats rather than nuts and added a few raisins and a touch of nutmeg. They turned out great !! My daughter loved them !! I will be making this again real soon !! Thanks for writing in Amy! What a great idea to use oats- perfect for people with nut allergies. Live near “the burgh” and have made these before-thanks for reminding me. We just love them and have all fall and winter. Ah! Just got back form “the burgh” — isn’t fall the best season there? Glad you like it! Well I used the coconut oil & it worked fine, I did find however I need more filling than the recipe called for. Maybe I got carried away with the core removal! I did pack it in pretty full tho. I also subbed granola for the nuts & that was a great idea. Made them for my daughter & her family for a treat for the granddaughters when I was viisting. We served them with a scoop of vanilla icecream over the hot apple & a drizzle of caramel sauce. Yummy! Thanks for the recipe! So when it says “pour in the apple cider….” does that mean just pour some in each apple center? Or in the actual crock pot? So when you say “preheat the crock pot and set to 3 hours” does that mean turn it on and set it to immediately cook the apples in 3 hours or turn it on and let it sit and preheat for 3 hours before you put the apples in? Can we add oats to this apple bake? Since I don't have walnuts? I have 4 crockpots! Love crockpot recipes! Have beef stew in one now, went apple picking yesterday so I am going to get out another crockpot and put these on for a night time football game snack!!! Thanks for sharing!!! I’ll be doing more so stay tuned! Anything I can subsitute apple juice/cider with? THANKS! You can use orange juice or even a sweet dessert wine (fun)! made these tonight & OH MY GOODNESS! AWESOME! Served with vanilla icecream! Heaven in a bowl! how do you store these if you have left overs? Let the apples cool and place them in an air-tight container then store in the fridge for up to three days. Would you recommend adding some OJ or orange essential oil, rather than the liquor, or just leave it out all together? I would actually use orange zest. Maybe a little juice from the orange I zest. I make something very simililer I like to put walnuts pecans an a whole cinn stick it looks really nice when serving along side warm pudding yummmm. Yes rolled oats would work well! She mentioned earlier that 1/4 cup of quick oats can be substituted for the nuts. She said that add a tablespoon of water to the oats first to moisten them before adding to the mixture. My friend made this and she advised me to cut the cooking time in half. She used spy apples and she said they literally blew up. I will be using gala apples and they are pretty big. I want them to stay in one piece. Do you recommend less time or maybe turning down the temp. to low? I only have high, low and warm. Mmmm, perhaps she used small-ish apples or sometimes Macintosh blow up like that since their flesh is less dense. Gala would be ideal and just set your cooker to low. Sounds good but I'd prefer to use real grass fed butter instead of synthetic margarine. Real fats will actually make the dessert more satisfying! Thanks for the recipe! In that case, I'm sure organic, unrefined coconut oil would be a delicious substitute! Sure coconut oil in moderation is fine. What if you don’t have a pairing knife or grapefruit spoon, what is an easy way to core the apples? I would love to make this soon. Any small knife with a sharp point would work. HI, I really would love to make these, but even the smell of butter/margerine makes my fiance sick. Do you think it would come out fine if I use olive oil instead? Sure you can use “light” olive oil, it has a very mild flavor, just drizzle a few teaspoons over the top of the apples. These look amazing! I’m thinking about making these for my sisters soccer team. There are 30 on the team including coaches, stats, and the ball kids. Do you think these could be made in a roaster? The game is about 2 hours away from home so I’m trying to figure out how to cook them and keep them warm so when the game is over there is a nice warm treat since it’s going to be literally freezing here! I made these last night, but in a covered casserole dish in the oven. I didn't have any apple juice or cider, so I just used some orange-apricot-mango juice that was in the fridge. Delicious! Thank you for the recipe! I just made these. Didn't use the liquor and didn't use the walnuts. Only problem was I cut the core all the way through. Ooops. Don't do that 🙂 But they still turned out AMAZING! So yummy! Sounds like a great exchange for a pie! I'll let you know how the family likes it. Oooh! These look and sound soo yummy(: I am going to make these tonight for a yummy Halloween treat! Margarine is a carcinogenic because of the high temps required to make it. LOL! You always have good ideas:) Miss you bunches!! Whick is the one with the chunky crystals? I'd think that is the closest to brown sugar in flavor. Your xylitol will work best. Just use like 1/2 of what the recipe calls for. Xylitol is sweeter than sugar. what is the best way to cut the apples? Thank you for a delicious recipe. I made these apples instead of pies for Thanksgiving and they were a hit. I posted about the apples on my blog and of course shared the linky love back to you. Crockpot Baked Stuffed Apples on Cook Lisa Cook. Great idea Lisa, thanks for posting ! Am I to cut the core all the way through or just most of the way? 🙂 I made these tonight for the first time! I let them go for 2 1/2 hrs which i think for my crockpot was a tad too long because they were too mushy for my preference. They were still very good though! The mixture only made enough filling for 4 apples though, so I made another batch for the remaining 2. I also didnt have apple cider/apple juice, so I peeled an apple and boiled it, then used the water in place of the cider/juice, it worked well, and i got a tasty boiled apple (that i coated in brown sugar and cinnamon) to eat while I waited for these to cook! I’m sure I will make these again in the future! So, you just pour the liquor/apple juice around the apples in the crockpot? how much liquor/apple juice do you pour? Cups? tablesspoons? please respond. Hey Victoria, it’s listed in the recipe. Just made these and had to stop myself from scarfing down the whole batch! I made them in a mini slow cooker–so just made 3 apples, but I made the full recipe of filling and that worked out great! Substituted quick oats for the nuts, since that’s what I had on hand. Ended up cooking them on high for the full 3 hours, and they came out perfectly soft and tender. Will definitely make these again! Thanks for the great recipe! Hi!! I’m getting ready to try your recipe..looks and sounds good, but I was wondering if you have one for a crust baked around the Apple so that when you cut into it all the juices pour out but still have some juices baked around the crust and in it. Any help? I think your recipe would be perfect just add a square crust so they meet corner to corner on top of Apple. Help!! Can I just wrap each apple in tinfoil individually? Will they bake faster if I do?